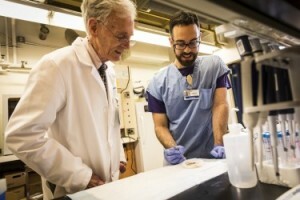 Pathologist and adjunct UW Urology Professor Larry True helped develop a cutting-edge microscope with colleagues from UW Mechanical Engineering that can provide surgeons with real-time pathology data to guide cancer-removal surgeries, as well as examine tumor biopsies in 3-D without damaging the tissue in the process – meaning the can be used down the road for genetic testing and diagnosis. The microscope and its capabilities are described in a paper authored by Dr. True and his collaborators in the June edition of the Journal Nature Biomedical Engineering (link below). Dr. True is a surgical pathologist with subspecialty expertise in genitourinary pathology and research on the molecular biology of prostate cancer, focused on tissue biomarkers of prognosis (for patients on active surveillance) and of prediction of response to systemic therapy (for patients whose prostate cancer has progressed). He is Director of Genitourinary Pathology at the Institute for Prostate Cancer Research and has served as a staff pathologist for UW Health Sciences Center and Seattle Cancer Care Alliance since 1991.